The return of Tomas Rosicky to form has helped Arsenal hugely in the last few weeks. The team has gone are now five victories in the last six matches, which is a record only bettered by Premier league leaders Manchester United. As a result, they have been able to close the gap on Chelsea and Tottenham for the fourth spot. The Czech Republic midfielder was once again at his influential best in the match against West Brom during the weekend. Arsenal managed a 2-1 win in the match, which helped them close the gap on Tottenham, who could only draw their match against Everton. Rosicky scored both goals in the 2-1 victory for Arsenal. Wenger has said that he is extremely keen on the midfielder ending his career at Arsenal. It was only a few years ago that the future of Rosicky as a footballer seemed a major doubt due to the never-ending injury problems. Wenger has said that he is truly a big player, who can make the difference in every match. He has also said that the team is not feeling extremely confident that they can finish in the top four at the end of the season. He has urged his players not to look at the results of Chelsea and Tottenham, but instead concentrate on their performances. “Tomas was fantastic. He is an important player for us. Unfortunately he was out injured for a long time. But every year he gives us a push at the end of the season. I hope he finishes his career with us. I rate him that highly. I am very pleased, it is three big points. We have 22 points out of the last 27 but we know our target is to continue to do that until the end of the season. We know we have one target to win our games, then we don’t have to look at Tottenham or Chelsea,” said Rosicky. The manager of Arsenal, Arsene Wenger, has said that the injury of Kieran Gibbs forced him to buy Nacho Monreal from Malaga. Gibbs injured his thigh while playing in the match against Liverpool on 30th of January. Initially, the injury didn’t seem to be a severe one, but, the further tests confirmed that the English left back needed 4-5 weeks to get fit. After Gibbs’ injury, Arsenal was left with only one left back in the form of Andre Santos. That’s why; Arsene Wenger decided to bring Nacho Monreal into the Arsenal camp. Monreal joined Arsenal just a few hours before the closure of the transfer window. The transfer fee paid by Arsenal is expected to be somewhere around 8 million Pounds. Monreal has signed a contract of 4 and half years for Arsenal. The Arsenal defender Kieran Gibbs has suggested that he is working to his maximum limit to help the team recover from the poor run of form, which they have been experiencing for the last few months. Arsenal made a good start to the Premier league season and were expected to be one of the contenders for the title finally this season. However, a very bad run of form in recent months have meant that they have fallen more than 15 points behind leaders Manchester United. Kieran Gibbs, who has been a first-team regular for the club since the departure of Clichy, has said that he has been working extremely hard in order to help the team in every way possible. The defender has suffered a number of niggling injuries so far this campaign, which have limited to him making only 12 appearances in all the competitions. Yet, he believes that he is working extremely hard in order to overcome the injury problems and make starts on a regular basis. Gibbs has stressed the importance of working hard as a team when not in possession of the ball, which is equally important as what a team does when in possession of the ball. 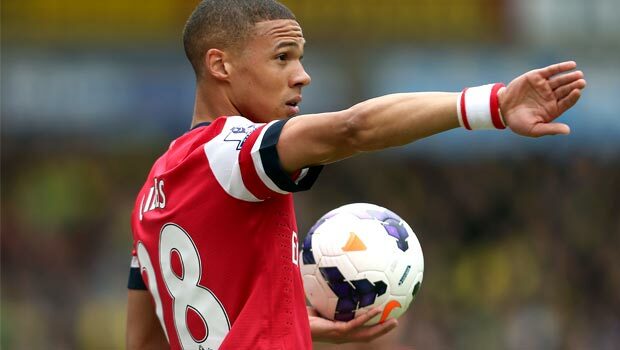 Gibbs was absent from the squad that played against Olympiacos, but is expected to return against West Brom. “It’s not just about what we do when we got the ball, it’s about what we do even more so when we haven’t got the ball. You just have to play the game how you think it needs to be played and if you give 100%, we know we’ve got the quality to get results. We should be doing that. I always knew that if I pick up a run of games, I can be positive for the team and have a big influence,” said Kieran Gibbs. Considering the gulf in class between Arsenal and Manchester City in relation to the final standings last term, the fact that Arsene Wenger has revealed his frustrations about only netting a point with the Etihad Stadium outfit speaks volumes about the progress the Gunners are making. Wenger claims that while he was happy to go back with a draw, he was still a little annoyed that his team couldn’t finish the defending champions off. Even though Arsenal fell behind to a Joleon Lescott goal in the 40th minute, the team kept on fighting and deservedly got an equaliser in the latter stages of the game thanks to Laurent Koscielny. However, before and after that goal were a host of missed opportunities, with Gervinho usually being the main culprit. The Ivory Coast striker spurned a host of decent opportunities, which left Wenger ruing what might have been at the end of the match. Nevertheless, the draw still provides the Gunners with an excellent start to the campaign, with the team currently sat in 5th position. Even though the club have already drawn three games this term, they are at least proving much more difficult to beat and many have credited Steve Bould for adding extra “steel” to the team. Of course, the next big test comes in the form of the current league leaders, with Chelsea set to arrive at the Emirates Stadium next week. The left back of Arsenal, Kieran Gibbs, is expected to be offered a new deal by the club pretty soon. 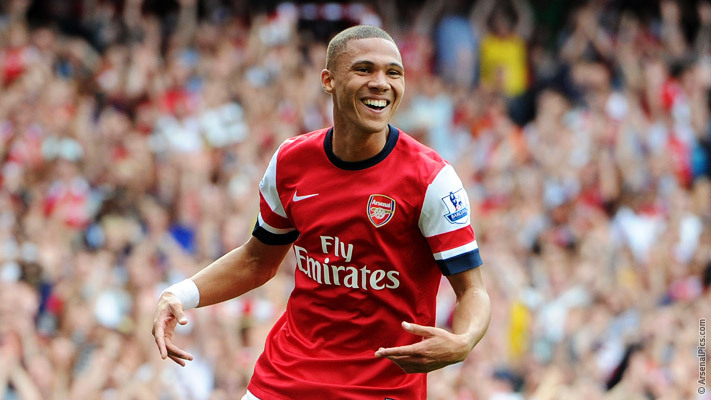 Gibbs’ contract with Arsenal is going to expire in 2014 and Arsene Wenger is keen to extend the contract of the defender. Gibbs’ performance in the last season was not that good, but, Wenger has a lot of faith in the English left back. Apart from Gibbs, some other Arsenal players are also supposed to get extension in their contracts. Bacary Sagna and Alex Oxlade-Chamberlain are among those players who might be signing a new deal with Arsenal in the next few days. Gibbs has been with Arsenal since the last 5 years. He had signed for the club in 2007 when he was just 18 years of age. He played his first match for Arsenal against Sheffield United in the League cup in October 2007. In January 2008, he was placed on loan to Norwich City for three months. He came back to Arsenal in April 2008. In his first season, he spent most of the time sitting on the bench. In the second half of the 2008-09 season, he was given regular first team opportunities and he performed quite well. He suffered a severe foot injury at the start of the next season which ruled him out of the team for the remaining part of the season. In the last two seasons, his performance was not up to the mark. During his five year tenure at Arsenal so far, he hasn’t been able to cement his place in the first XI. Gibbs himself hasn’t yet given any statement about the extension of his contract. On being asked about the new contract, he said that he doesn’t want to think about the new deal at the moment. He just wants to focus on his game and do well for Arsenal in the current season. Arsenal defender Kieran Gibbs has said that he wants to bring an end to his injury problems, which have affected the number of games he has started in the last few seasons for Arsenal. It is widely acknowledged that the young defender is all set to become the replacement for Gael Clichy after impressing in a number of appearances for the club. He has been thought of as a player who is very similar to Gael Clichy, but with the defensive abilities of the former Arsenal defender Ashley Cole. However, he is yet to make the grade in terms of regularly appearing for the first team. Injuries have made it very difficult for the England under 21 international to appear in the Arsenal first team regularly. He is hoping that this season will be different from the rest. The 22-year-old made only 22 appearances for the club last season, which is not a great record for someone aiming to become a first team regular at the club. However, it has not been due to the poor performances, but due to the poor luck he has had with injuries. Speaking on the pre-season tour of Asia, Kieran Gibbs has said that he is hoping that this will be his first full season with the club. “I hope to play a full season this year. I was out a bit last year with a few injuries but this year I’m feeling strong. From the start of the season, I was happy with there I was going but I don’t know what happened with my injuries to be honest. We spent a long time trying to find out what was wrong. At one point, we had no fit full-back and when we had all those injuries, we basically had half the squad for many parts of the season. A lot of people didn’t realise that,” said Kieron Gibbs. Arsenal manager Arsene Wenger has said that defender Kieran Gibbs gives us a lot of credit for his last ditch tackle against Billy Jones in the final few minutes of the match against West Brom. Arsenal were winning the match 3-2 thanks to many errors from West Brom goalkeeper Martin Fulop. However, West Brom could have equalised at the very last moment after they capitalised on an error from Arsenal. Kieran Gibbs, who is currently seen as the replacement for Gael Clichy, made a last-ditch tackle on Jones in order to prevent West Brom from equalising. That block has proven extremely crucial given that Tottenham were winning their match against Fulham comfortably 2-0. If Arsenal had drawn the match, then they would have lost the third position to Tottenham. It would have meant Arsenal would not have been able to qualify for the Champions League automatically. Now, they are into the group stages for the 15th consecutive season under Arsene Wenger. Martin Fulop was replacing the injured Ben foster in goal for West Brom. He proved that the former Birmingham city goalkeeper was clearly the number one at West Bromwich by making a number of errors in the final match for Roy Hodgson. “There are only three clubs in Europe who’ve done that, [the other two being Real Madrid and Manchester United]. In September [actually October] we were 17th after losing four of the first seven. It was very difficult to imagine we could finish third, but we had an exceptional run after our exit from the Champions League. They showed mental solidity and unity, stayed united and came back,” said Arsene Wenger after the match regarding the record Arsenal have in this competition since his arrival. Tottenham will have to settle for the fourth position and they could miss out on the Champions League if Chelsea win the title. Arsenal youngster Ignasi Miquel has said that he is enjoying his life as the left back for Arsenal. Arsenal have an injury crisis in the defence right now and youngster Ignasi Miquel has been called upon to fill in the gap left by the injuries to Andre Santos and Kieran Gibbs. The youngster has impressed a lot in the fixtures that he has been called upon, and is looking to become a permanent fixture in the Arsenal defence. Despite missing a number of players, Arsenal have risen up the table to fifth position. It is something that was almost unimaginable only a few months ago after the 8-2 defeat at the hands of Manchester United. The 19-year-old Ignasi Miquel’s preferred position is centre back, but he has been able to adapt in the left back position quite brilliantly. Even though he has admitted that it was initially challenging, he says that he says grown into the role. He has said that his main aim now is to keep his position in the team and not lose it after the return of first-team regulars like Andre Santos. He has also said that he is very much happy with the amount of game time he has been getting at Arsenal this season, which has prevented him from looking at the option of going out on loan. “In the last two or three years I have been playing at centre back so it’s quite hard for me to get back to left back. Once you get there training and playing a couple of games, it is just another position. But to be fair I used to play there and you more or less try to remember what you can from when you were younger,” Miquel told club’s official website.